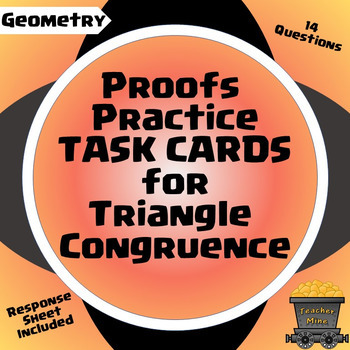 This set of task cards includes 14 proofs related to triangle congruence using the following concepts: SSS, SAS, ASA, AAS, HL, Reflexive Property of Congruence, Isosceles Triangle Theorem, Parallel Lines, Alternate Interior Angles, Substitution, Segment Bisector, Angle Bisector, Definition of Congruence, Perpendicular Lines, Right Angle Congruence, Midpoint, Vertical Angles, CPCTC, and overlapping triangles. Task cards can be used in many ways. One of the ways that I have recently begun to use them in my classroom is as a multi-version assessment. This has been a great new use for them. The students must record responses to 6 of the task cards along with the # of the card on the Response Sheet. I provide multiple copies of each task card and randomly pass them around the room. As a student completes a card, he/she returns it to a designated location and picks up another one. In this way, all of the students are working on problems, but they are rarely working on the same one. This makes it difficult for them to engage in dishonest behavior. And it is quick to score. The product contains student versions with a white background, and additionally, a second version is provided with an orange background for odd numbered problems and a green background for even numbered problems. Please go to your My Purchases page. Beside each purchase you'll see a Provide Feedback button. Simply click it and you will be taken to a page where you can give a quick rating and leave a short comment for the product. Each time you give feedback, TPT gives you feedback credits that you use to lower the cost of your future purchases. Your feedback will help me to create high-quality products.